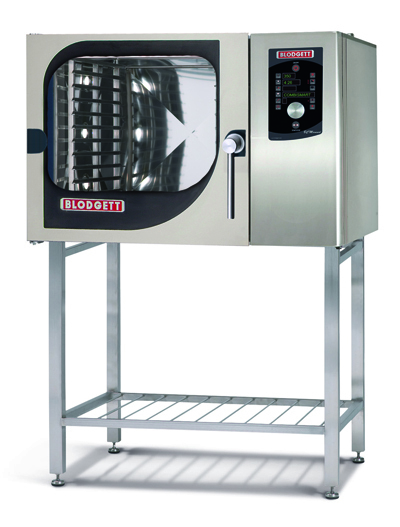 Blodgett’s HydroVection oven fills a niche in the market between traditional convection ovens and combi ovens.. It cooks with convection heat and humidity, not steam. It’s a great oven with many applications, but if a combi is really what an operator needs, then the new Blodgett 62 Series combi ovens are designed to improve their product quality and increase yield while decreasing labor and cleaning costs. The 62 Series ovens are full-size combis designed to hold five full-sized sheet pans or 10 hotel pans. Boilerless models are available in gas or electric. Boiler based models are available in electric only. All are built with 304 stainless steel exteriors and interiors. The lift hinge field reversible doors feature a step safety door latch and a door mounted drip tray to reduce the risk of wet floors. With double panes of tempered glass, the inner panes are hinged for easy cleaning. Operation of the 62 Series ovens couldn’t be easier. The ovens feature five modes of operation: retherm, hot air, steam, and two different levels of combi cooking. The reversible 9-speed fan optimizes baking and roasting. To get consistent results every time, the 62 Series ovens allow you to program 50 recipes, with up to 10 steps in each, including delayed start. What really sets the 62 Series combi ovens apart is that they wash themselves. Now that saves on labor costs. The automated CombiWash function uses very little water and detergent. Moreover, only Blodgett allows you to use your own cleaners. That eliminates the expense of proprietary chemicals. The one-touch automatic deliming system can also be operated with generic deliming chemicals.